Disney presents the Snow White and Seven Dwarfs: Diamond edition DVD and Blue- Ray combo plush pack. The plush pack includes a plush of each of the seven dwarfs as well as a Diamond Edition Blu-ray and DVD Combo Pack. Limited time Disney Blu-ray Combo Packs include a Blu-ray and a DVD of the movie all in one package. Combo Packs provide unprecedented value, quality, and versatility with the exceptional picture and sound of Blu-ray and the extended utility of DVD. You can enjoy the incredible high definition experience of Blu-ray at home, and use the DVD in the kids’ room, in the car, or on your computer. Disney Blu-ray Combo Packs are the perfect way to start your Blu-ray collection! 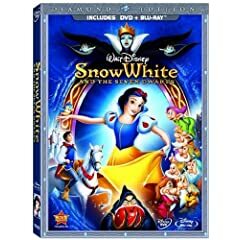 Win a Snow White and Seven Dwarfs: Diamond edition DVD and Blue- Ray combo plush pack! To enter the contest, simply tell us what’s the most embarassing date story you’ve heard and why. Send in your answers using the comment form below. Last date for entries is October 15, 2009.